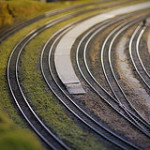 Trying to figure out why your model railway train judders, stops and starts? Don’t panic. 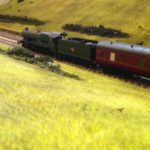 Here are 7 easy and quick tips from model railway gurus across the Internet to get your loco running smoothly. Troubleshoot Your Trains — Engine or Layout? The first thing I look at when trying to solve why a model train runs slowly or occasionally stops and judders is to identify if the problem is with your layout or a particular train. Find the spot where you have problems and then test run all your trains over it. Does the problem occur with the several trains or just on one particular engine? If problems occur with multiple trains, logic dictates it’s not the locomotives but the track. Skip forward to track cleaning. If it is just a single unit, it’s more than likely that the problem lies with that train. The most common issue stopping locomotives running is dirt on the wheels causing them to lose traction or fail to pick up power. Dirt on wheels is a common problem so cleaning the wheels should be done regularly. Luckily, it’s easy and quick to do. If it’s an older locomotive, it could be dirty wheels but you might also need to oil and lubricate the gears. Again, this is something that needs doing occasionally, although not as often as cleaning the wheels, and the last post in the last link explains everything you need to know. If you’ve done both of these and it still won’t work, there’s something broken and it needs repairing. Send it back to where you got it from, Hornby etc, or Google “model train repairs” to find a repair service if it’s not under warranty. If however other engines exhibit the same stop and start symptoms then it’s likely to a problem with the track or power on or to the track. in which case the other techniques below should solve your problems. 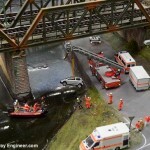 If your model railway is in typical home and inhabited by children, cats and/or dogs, your miniature wonderland could be under siege from all manner of giant particles that will cause small trains any number of problems and cleaning the rails will be vital. RJF Trains, an American dealer, points out “normal” house dust, dander, baby dust bunnies, cat hair, smoke particles and sawdust all mix with the oxidisation process that occurs when current passes between metals and can create a “truly impressive challenge”. Goo Gone (American visitors use this link for faster delivery) is my preferred choice for cleaning particularly dirty track. This is rubbed over the track to clear particularly stubborn grease and grime that build up over time. It can either be quickly applied as mentioned below to remedy one-off problems or as RJF suggest as part of a regular cleaning schedule by fitting out a train with front and rear cleaners. Alternatively, it may be just routine dust and dirt that builds on model railway track — be it Peco, Hornby or any other brand — over time. This can play havoc with your rolling stock wheels or interrupt the smooth flow of current to the locomotive that will bring your trains to a halt, slow down or cause them to judder. > Sign up now to my newsletter for more tips like this to make your model railway better. It’s free, you can unsubscribe at any point and I promise to never spam you. Again, Goo Gone (American model railroaders please click here) will work wonders here but most people (myself included) use a lint-free cloth dampened with a cleaning alcohol and then rubbed over the railheads as described here. But be careful however not to get it on your rolling stock or scenery paintwork, just wrap the cloth around your fingertip, drip some onto it and run this over the top of the track. (If you’re in the middle of constructing your layout, you might also have glue and paint on the track. If this is the case a track rubber – available via my shop – will make easy work of shifting it). MRE Tip: Never use sandpaper or scouring pad – this will scratch the rails making it easier for dirt to accumulate. 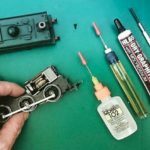 If you’re looking for more tips on loco cleaning, see The Top 5 Model Train Maintenance Checks. Faulty Track Wiring or Badly Joined Joints? 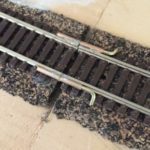 According to Hornby Train Restorations another common issue that could be causing your trains to slow or stop, particularly in bigger layouts, are the joints between track sections. 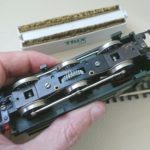 Replace worn or loose fish-plates/rail joiners and electrically connect the track pieces together with a track power booster cable. Over on modelrailwayforum.co.uk they suggest checking that the fishplates are tightly fitted to the rails by using a pair of pliers to lightly squeeze the bottom of the joiner onto the rail foot area. Lose or poor power connections will also cause all manner of problems from no movement at all to sluggish performance. This is particularly common for layouts that aren’t permanent and are regularly set up or rearranged and where the wires are regularly moved around. Check that the wires connect to the track and to the power supply securely; pay attention to lose or tight wiring, frayed or split ends and confirm all wires are connected to the right terminals. 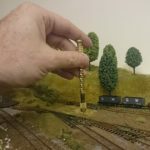 Rounding up these 7 Tips To Will Make Your Model Train Run Smoothly is a rare but easy problem to solve. If you’ve tried all the above and are still experiencing problems it may not be a problem with your loco or track at all but down to a question of length. When first starting out, many people string together carriages, wagons and other rolling stock to make the longest train they can. Locomotives don’t have infinite power and if the trains are too long they might not have enough power to pull all the carriages and wagons you’ve lined up. Alternatively, when long trains go around corners or up slopes the speed can vary across the length of the train set resulting in surging/contraction at different points with the resultant problems. This usually results in derailment rather than stopped trains but it can happen. Try reducing the length of your train, this or one of the above other techniques should get your trains running. How do you keep your trains running smoothly? Please share your tips with other readers by adding a comment below. In the majority of cases, trains that previously worked but now stop and start are caused by dirt on the wheels, track or the gears need oiling. To clean locomotive wheels, get the Trix wheel cleaner. To oil locomotive gears, use cleaning oil or Gaugemaster lubricator. To remove paint/glue from rails use a track rubber. For routine cleaning of track, use Goo Gone or cleaning alcohol. A final, personal, note: I spend a LOT of time testing, photographing, writing and often wrecking my own layouts researching techniques for these articles and don’t charge a penny for them. If this article is useful to you or helpful, please add a comment to say so, it gives me encouragement to continue. Thanks and happy modelling, Andy. ← Are Wooden Trains Compatible? No problem Mike, glad you find it helpful. One tip I have is to clean the contact area on the wheels and the pickups. I use a fibre glass brush with a small vacuum to such the debris away. For track cleaning,i find car brake/clutch cleaner very good,but has to be used carefully as it is VERY flammable! Hi Ken, great suggestion and totally agree! Both are certainly in my tool kit, I mentioned fibre glass pencils in the companion post to this : http://modelrailwayengineer.com/model-train-maintenance-wheel-cleaning/ . Thanks! 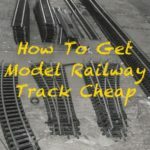 I really enjoy model railroading and wish I had the space, time and money to craft my dream layout… Thank you for sharing such in-depth and great information! Is it possible for the controllers/transformers to lose power when they are getting older and does the length of the track affect the power? I’m working in N gauge and my track is a circular one on a 32ft baseboard so the total length of the track is about 70ft. I’ve also noticed that if I run two locos on the main controller ( it’s a Powermaster with 6 outlets) they run slower than when I only run one. Yes, especially for re length of track/multiple. I’d have multiple connections from the power feed to the track for this distance and each loco will draw power reducing the amount for others. Do you have all six outlets connected to the track? Btw, 70ft of track is a great size! What are you building, would love to know more. That sounds great, you’ll be able to do create a wonderful layout in that amount of space. Re power, you’ll need a controller and feed for each section you want to run different trains on or will it be one long section or are you asking how you boost the power? Basically yes. I am worried about loss of power if I have such a large oval circuit. On a small oval circuit one power clip to the track would be fine. However on such a large expanse of track I am questioning if I need to put several feeds from the transformer say every 1 mtr in order that the power is not lost further down the track. If so do I feed each wire to the next power clip a bit like a Christmas tree or would I feed each wire directly from the power clip straight back to the transformer. This would obviously result in a lot of wiring and what would happen when it got back to the transformer. Would I feed them to some sort of block and then have two wires from the block directly in to the transformer. Ah, got you now! You’re right to think you could do with extra feeder wires. I’d use connector block on the main feed wire with wires either soldered to the track or attached via power clips connecting into this. Take a look from 2 minutes, 20 secs in. Using these with longer wires between the clips should do the trick. It sounds a great layout, what do you have planned inside the oval? I’ve just started to build a model railway exactly the same size. I saw the Everard U tube clips and I copied the same connectivity. He stripped a roll of household building wire and laid the positive and the negative wire under the layout board following the track above. I powered each track 4 times by putting “droppers” in a 150 foot run connecting to the said household building wire. “Droppers” are short lengths of thin wire ,red live blue negative, soldered to the track through a small drilled hole close to the track and clipped on to the household wire at the other end. I’m running in my track after ballasting and I’ve had no problems so far. I’m running 9 trains with sound all at once. My track is Remote controlled DCC. Hope this helps. Thanks for sharing this Steve, that sounds like quite a layout. Would love to see some pictures sometime. Hi Alan, what gauge are you starting in? Hi Andy I am just building my first portable base board ,How do you join up the track again after you split the baseboard in half at the joint using fishn plates?? Otherwise, let reply here with more details and I’ll be happy to help. Hello, wonder if you can help me. Have just bought my son his first Hornby train set. He has a oo gauge pendollino and the Eurostar. The gentleman in the model rail shop advised I buy an older controller as the ones that come with the kit apparently aren’t very good so I purchased an R965. Once it was all connected I switched it on but it has no speed control, only fast, so the trains derail. I took it back to the shop, they tested it and it was fine but they gave me another one anyway but again it only has one speed, fast!! Could this have anything to do with the track. The man in the shop (who is very experienced) said he didn’t know why this was happening. Any help would be appreciated. Many thanks. Hi Andy, thanks so much for your quick response. Glad to hear that this problem isn’t unknown on the R965. Will buy a gaugemaster controller in the next day or so and hopefully my son (and me) can enjoy his train set. Many thanks. I just bought a Marklin Start Up Starter Set 29173 in order to put it around the Christmas Tree. Unfortunately if no other commands are sent within 3 minutes of the last command, the base station shuts off the voltage in the track for safety reasons as per manual…..Is that true??? I must be on top to push every three minutes the IR Control in order locomotive to keep going? ?There is no chance to programme loco to run continuously? Thanks. If I knew that, I wouldnt bought this firm, Maybe other firms such us ROCO, PICO, ESU, SUDEXPRESS, BRAWA,Liliput etc etc dosent have such kind of restrictions…! If you know a model that doesnt stops 🙂 please let me know. My best wishes from Greece for a Happy 2017. Hi I’m starting my Hornby oo layout in my spare garage can you let me know if there are any problems Ie: temperature be it very cold or hot many thanks Barry. Hey Andy, I’ve just started my own Hornby OO gauge train set. I choose the Flying Scotsman train set and have acquired a Hornby Thomas and Percy as well. In regards to my train set, there always seems to be a loss of power around the back straight of my layout with all of my engines and I’m not sure why, and in Regards to my Hornby Percy, after I run him for a while, there is a smokey smell coming from the motor and when not on the rails, he is free-wheeling and I don’t know who to fix this. Hi Will, nice trains you have there! If the power track connections are at the front of the oval I’d take an educated guess that some of the track joints are flaky and the power isn’t making its way to the rear of the oval hence the problem you’re seeing. Check all the joints and reconnect them. Alternatively you could get link wires (see my earlier post on these http://modelrailwayengineer.com/how-to-connect-additional-power-to-a-model-railway-set/) so you have power wires around the circuit and aren’t so reliant on the joints carrying the electricity to all sections. Was the Hornby Percy new or second hand? Burning smells are usually a bad sign but uncommon in new locos? Hi i have a dapol engine that has just stopped working when i remove the cover the light on the front of train is on to show power, but the train will not move any advice please. I have a OO u shaped layout 6x6x6 2feet wide layout In your opinion,which is the best controller to use,it is of single track. I have trouble with a Trix Britannia class engine N gauge. The rear LHS driving wheel seems to move about on the axle ie loose on stripping down The wheel slide off the axle easily, is this incorrect due to wear? the opp wheel is fast to the axle. if a salution is possible ie Loctite wheel to axle how is it set with the opposite wheel ie position of connecting rods etc. Just watched an interesting video on u tube.seems to dispel the myth about not using WD40 or 3in1 oil on locos. The trick seems to be just using a tiny spot of oil. I use 5/40 from the tip of a pin. No harm done so far on 60 locos. Hornby want you to buy their expensive oil but it’s not necessary. Two cars per axle is a good rule of thumb. Meanwhile, remember power packs in most sets are minimal and only run “average” locos. “Average” is determined by Athearn blue-box locos or in their sets according to the guys at Bachmann. I use old packs (I have six of them) and they still have original outputs. I have long tracks so I direct wire one to half a circle (my mains are thirty-some feet long) to half of one using common wire on ground (-) and plastic insulators on the live track side (+). I use a second power pack for the other half. I also solder a lot of my connections taking a voltmeter around the track for voltage drops. I also use 12 gauge wire for connecting to the transformer, but only at the middle connections. I hope this helps.